Bibi Russell who is an UNESCO Artist for peace, is a household name in Bangladesh popularly called “The pride of Bangladesh”. She is an inspiration for the rest of us in Ethical fashion and craft communities. Bibi is a fashion designer and former international model from Bangladesh. Born and raised in Bangladesh, she was the first Bangladeshi girl who went to am international fashion school. She studied in London College of Fashion, earning a graduate degree in 1975. Here she was encouraged by a teacher to model for her own graduation collection and she did so in front of the best in the fashion industry back then.Her first assignment was a grand 14 page shoot for Harper’s Bazaar! She has worked as a model for different magazines including Vogue, Cosmopolitan and Harper’s Bazaar. She also worked as a fashion model in fashion shows until 1994, working with Yves Saint Laurent, Kenzo, Karl Lagerfeld and Giorgio Armani. Bibi believes this has given her the knowledge and understanding of the industry which helped her become the role-model she is today. Bibi didn’t let this success get to her head. Her vision was clear. She was not in fashion to become a supermodel or a famous designer for any international brand. Although people still remember Bibi as the first Asian supermodel, what she wanted out of all that learning in fashion was to strive for Bangladesh and its craft. 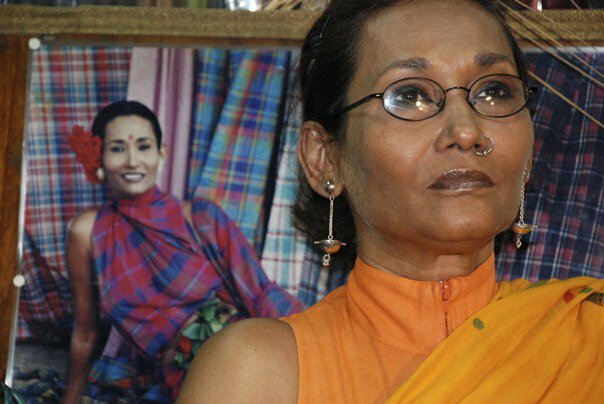 She gathered enough strength and focus to cut out from everything else and returned to Bangladesh in 1994 to save and revive the crafts of her country. In Bangladesh there is no middle class, you are either rich or poor. I am here to help you come out of the poverty line. I am with you and you have to work hard with me to bring you out of poverty. I do not believe in charity- it never helps! People can buy from me thinking of it as charity once and they will forget about it but I want to share the beauty of the craft which YOU will create. Bibi productions is for the people of Bangladesh.